As culinary director of Hotel Emma, John Brand is a true representative of that uniquely American class of chef—self-taught—having worked his way up to become a nationally recognized chef from a teenage dishwasher in Wisconsin. Twenty-five years later his vision is guiding Hotel Emma’s raison d’etre: a great hotel, the cultural and culinary center of the city—the place with the best restaurant, the best martini, and the place we meet to celebrate, make deals, and how off what we love most about where we live. Brand oversees three epicurean properties at Hotel Emma that include Supper, the hotel restaurant; Larder, the in-house market and cafe; and the Sternewirth, the Hotel Emma bar. Led by Chef Brand’s vision, Hotel Emma boasts an array of contemporary cuisine and dining options that are comforting and imaginative. Inspired by San Antonio’s gastronome resurgence, the hotel’s innovative approach to service also includes an in-house culinary concierge. His philosophy and approach to food centers on developing approachable meals that showcase hyper-seasonal offerings and flavor profiles that both highlight and preserve the integrity of ingredients through skillful preparation. 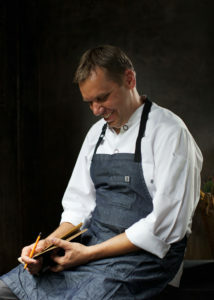 Over the course of his career, John has developed a methodology to cuisine that focuses on honest, un-manipulated flavors, cliché-free menus, simple food perfectly prepared, thoughtful sourcing that isn’t preachy, creating traditions, and establishing a neighborhood restaurant as well as food and beverage experiences throughout Hotel Emma that will bring guests, like family, back again and again. During Brand’s tenure in the culinary industry, he has left his mark at several top-rated fine dining restaurants across the country including The Little Nell in Aspen, Keswick Hall in Charlottesville, and the Broadmoor in Colorado Springs. Brand has garnered significant acclaim and recognition for his cuisine that includes being named to Esquire’s “Top 20 Best New Restaurants” for Fossett’s. He has been invited to showcase his culinary skills at the James Beard House, Aspen Food and Wine Festival, the French Culinary Institute, Condé Nast headquarters, and Saveur Magazine, to name a few. Brand was also tapped by the Culinary Institute of America to develop four culinary master programs for executive chefs.